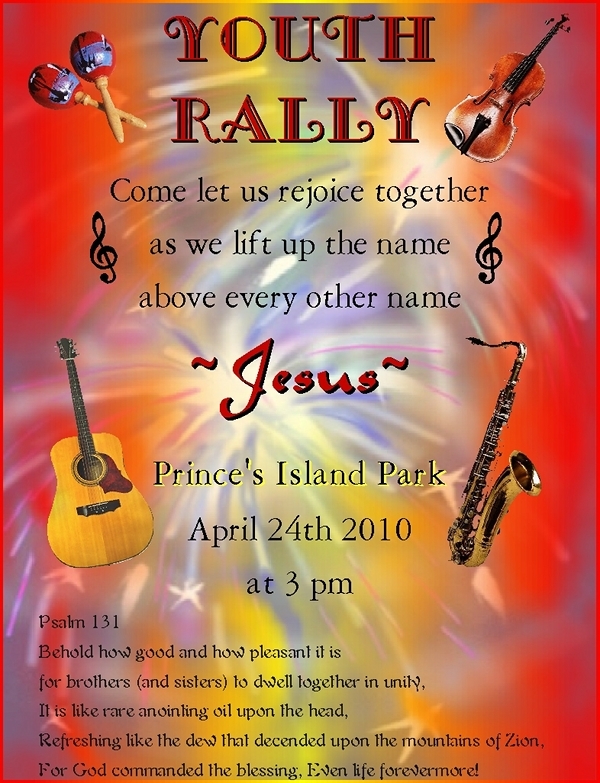 We are very excited to announce the upcoming Christian youth rally at Prince’s Island Park on April 24th of this year. This event is a rallying call for the youth to come out and get excited for Jesus. We believe that this will light a fire and encourage the youth to be even more excited about living out loud for Jesus. The focus of this event is to pray and worship, before the March for Jesus, a sort of preparation for great and mighty exploits for the Lord. So come, young people to a great event you won’t want to miss. Chaparones and those who are young at heart, come and lead the way as an example to the future generation.